Where: On the far left-hand corner of an intersection. destinations that can be reached from this intersection. Action: Slow down and make sure you take the correct route. Also look out for other traffic at the intersection that might not yield. route. 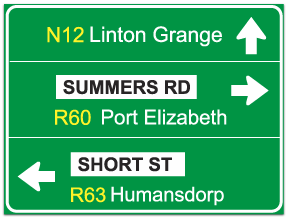 Where: On the left-hand side of the road a short distance beyond an intersection. Purpose: To confirm the route to a destination and the distance indicated in kilometres to such destinations. Action: Note the destination and in particular note the distance to the destination so that you can plan your trip to fill up with petrol or rest.